Filipe Toledo (BRA), 20, won the Moche Rip Curl Pro Portugal over tour rookie Italo Ferreira (BRA), 20, on Friday in an amazing final contested in solid 2.0 metre (six foot) surf at the iconic Supertubos in Peniche. Toledo started his final with a bang, claiming the event’s second perfect 10 point ride for a combination of two aerial manoeuvres and transitional floaters to launch his assault towards a third event title this season. In a combination situation halfway through the Final, Ferreira took his air game to the next level and launched into a huge aerial for a near-perfect 9.93 that put him right back into the battle for first place. Brett Simpson (USA), 30, equalled his career-best result with a 3rd place in Peniche, defeated by event winner Toledo in their Semifinal bout. Simpson had a solid campaign in Portugal, defeating Kelly Slater (USA), Joel Parkinson (AUS) and giant killer Frederico Morais (PRT) for his spot in the semis among other big performances. This result will propel Simpson to 26th on the CT rankings, giving the Californian a shot at requalification in Hawaii. If Fanning wins the event he will clinch the World Title. All the results, photos and video footage from the Moche Rip Curl Pro can be found on WorldSurfLeague.com and on the WSL mobile app. Giant-slayer Frederico Morais (PRT), 23, who had dispatched current WSL No. 2 Adriano de Souza (BRA) and Kolohe Andino (USA) to Round 2 in his opening heat, produced yet another huge upset today by eliminating current Jeep Leaderboard frontrunner Mick Fanning (AUS), 34, from the event. Morais launched his assault in the opening minutes of their exchange with a near-perfect 9.13 (out of 10), displaying his signature forehand power carves and combination snaps to top it off. The talented natural footer backed up his top score to take the biggest win of his young career. Inspired by his countryman’s heroics, reigning World Junior Champion Vasco Ribeiro (PRT), 20, went on to defeat De Souza (BRA) in the very next heat. Backed up against the wall, Ribeiro found a way to score an excellent 8.43 to seal the deal. Brazil’s Filipe Toledo (BRA), 20, solidified his outstanding 2015 season with an inspiring performance for a spot in the quarterfinals. The current WSL No.6 — who has won two events this year already — showed his predilection for progressive aerial manoeuvres, delivering multiple big scores to defeat wildcard Mason Ho (HAW), 27, in Round 3 and dominate his Round 4 match-up. Current WSL No.9 Jeremy Flores (FRA), 27, collected one of the day’s highest combined heat totals, an impressive 17.26 including a near-perfect 9.43 on a long right-hander which the young Frenchman dismantled from start to finish. Flores’ crisp carves on the open face coincided with the perfect tide that pushed glassy 1.5 m (five foot) walls through the lineup. 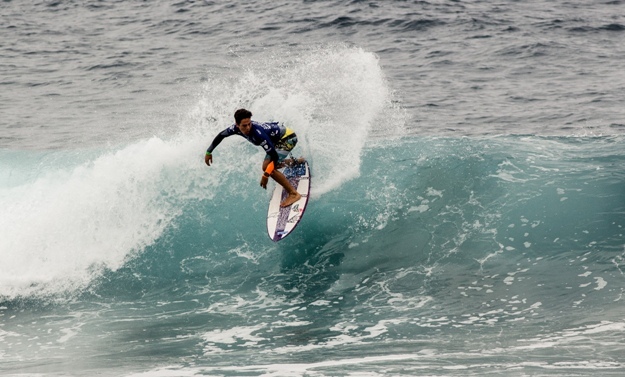 With the eliminations of Caio Ibelli (BRA) and Sebastian Zietz (HAW) today, Andino officially claimed the Portuguese Waves Series – Cascais Trophy, and the US$25,000 prize money bonus, rewarding his consistency throughout the Portuguese leg of events in Azores, Cascais and now Peniche. Brett Simpson (USA), 30, eliminated 11-time WSL Champion Kelly Slater (USA), 43, in Round 3 with a solid display of powerful and progressive surfing to reach the fourth round for the first time this season. Simpson found his rhythm early on and managed to keep his opponent off of the best waves to control the matchup and take an important win. Up first when the event resumes will be Vasco Ribeiro (PRT), Keanu Asing (HAW) and Jeremy Flores (FRA) at the Moche Rip Curl Pro Portugal. Round 4 winners progress directly to the quarterfinals while the surfers placing second and third battle for the remaining quarterfinal berths in Round 5. After calling a lay day on Monday, organisers will convene at 9am South African time on Tuesday to make a call on when to resume competition. 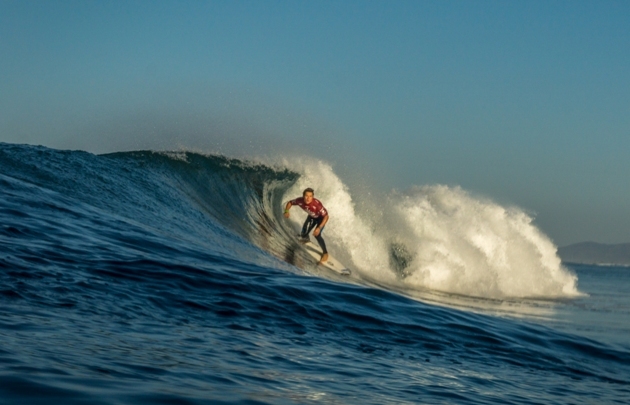 The Moche Rip Curl Pro Portugal will run from October 20 – 31, 2015 and can be watched LIVE via webcast on WorldSurfLeague.com and on the WSL mobile app. Shane Sykes was the star performer for South Africa on Tuesday as the team posted mixed results on the second day of the VISSLA ISA World Junior Surfing Championship at Oceanside in California. 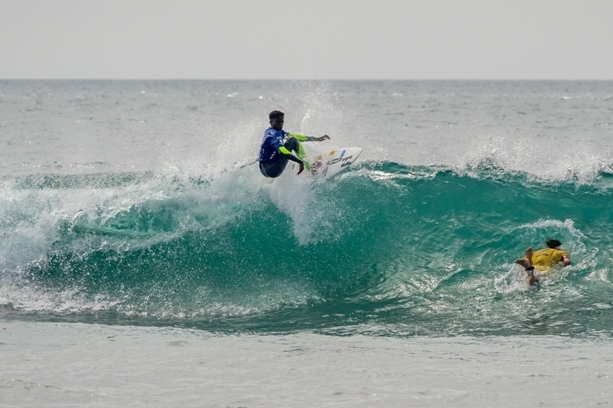 Spectacular 1.0 to 1.5 metre waves, warm water and pristine weather continued to provide the 322 competitors from 36 countries in the world’s biggest junior surfing event with the ideal conditions in their quest for individual and team honours. Sykes, the team captain, again led by example, accumulating a heat total of 13.43 to relegate Nolan Rapoza from the strong USA team to the runner-up berth as the pair moved into the last 32 in the U18 boys’ Main Event. Ntando Msibi joined Sykes in Main Event Round 3 when he finished second behind Colt Ward (USA) in a nail-biting heat where the Durbanite avoided dropping into the do-or-die Repercharge Rounds by finishing just 0.03 of a point ahead of third placed Ramon Barreca from Argentina. Richard Kidd was not as fortunate, ending his heat 0.06 of a point behind second placed Alejandro Fuenzalid from Chile, and he now faces the prospect of competing in the Repercharge Rounds along with teammate Michael Monk who also placed third in his heat yesterday. The U16 boys completed 12 of their 16 Main Event Round 2 heats. Both Sebastian Williams and Luke Malherbe grabbed runner-up spots to remain in the top tier of the event while Adin Masencamp will be action in Heat 15 today against Day 1 highest point scorer Logan Bediamol (HAW) and competitors from Argentina and Ecuador. Girls’ competition got underway in front of the judges on the South side of the Oceanside pier. All three South Africans in action struggled to find the waves offering high scoring potential and dropped into the Repercharge stream. In the U18 girls division Teal Hogg could only muster 2.27 points and ended fourth in her opening heat while Chanelle Botha was unlucky to finish third, just 0.10 of a point behind Sofia Loewy from Colombia, in a tightly contested low scoring encounter. Olivia Izzard was third in her U16 girls’ heat while Sophie Bell will start her campaign in Heat 14 of Round 1 when competition resumes today. Leonardo Fioravanti, the sole competitor representing Italy, recorded the standout performance in the U18 boys’ Round 2, earning the highest heat total (18.97) and highest single wave score (9.8) out of all the competitors in action on Day 2. Surfline, the official forecaster, is calling for even more amazing conditions on Wednesday with 3-5’ wave faces (1.0 to 1.5 metre) and occasional larger peaks on the best tides. The morning will feature light offshore wind, trending to light onshore in the afternoon. See schedule for Day 3 below with the South African team members who will be action and their heat numbers in brackets. 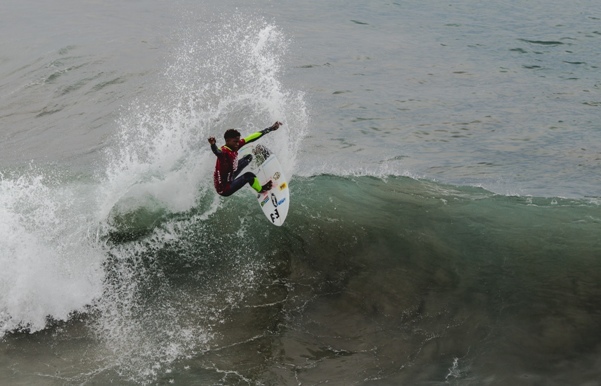 The South African Junior Surfing team posted a near perfect performance on the opening day of the VISSLA ISA World Junior Surfing Championship which got underway in excellent 1.0 to 1.5 metre waves and ideal weather conditions at Oceanside in California on Monday. Team captain Shane Sykes led the way as seven of the eight SA team members in action on the day advanced directly to Round 2 of the Main Event in the world’s biggest junior surfing event which ran through 30 heats in each of U18 and U16 boys’ divisions. Competing in the U18 boys’ on the South side of the Oceanside Pier, Sykes set the bar for the team as early as the second heat of the event when he won his closely fought Round 1 heat. He progressed along with heat runner-up, Luis Perloiro from Portugal, as they relegated their third and fourth placed opponents from Belgium and Denmark to the grueling Repercharge Rounds. Teammates Ntando Msibi and Richard Kidd racked up narrow victories before Michael Monk, competing in the last heat of the day, made it a clean sweep of opening day heat wins for SA’s U18 boys. Sebastian Williams, contesting the U16 boys’ division in great waves on the North side of the pier, delivered the standout performance for the team. Having grown up in California and Mexico before relocating to South Africa, Williams was in tune with the waves on offer and used his wide repertoire of manoeuvres to earn scores of 8.43 (the third highest of the day) and 7.50 for a two-wave heat tally of 15.93, the fourth highest in all 60 heats run on Day 1. Fellow SA U16’s, Luke Malherbe and Adin Masencamp, both finished comfortably in second place behind their respective Portuguese rivals to remain in the Main Event stream. Joshe Faulkner was the only SA team member to drop into the Repecharge Rounds when he slipped to third place in his opening encounter. The tenacious teenager from Jeffreys Bay will being doing his utmost to post first or second place finishes in 10 consecutive heats to reach the Grand Final of the U16 boys division. Logan Bediamol from the Hawaii recorded both the highest single ride score (9.67 out of 10) and heat total (17.87 out of 20) in the U16 boys as the defending ISA World Junior Team champions completed eight out of eight heat victories in their quest to secure back-to-back team gold medals and the prestigious ISA World Junior Team Champion Trophy. The VISSLA ISA World Junior Surfing Championship runs until Sunday 18 October and the action can be followed live at http://isaworlds.com/juniors/en/ starting at approximately 4pm SA time daily. The latest news, results, photographs and video footage are also available on the website. Shane Sykes has been selected as the Captain of the 12-person South African Junior Team which gets its campaign underway for individual and team honours at the 2015 VISSLA ISA World Junior Surfing Championship at Oceanside in California today. The team, managed by Isaac February and coached by Greg Emslie and David Malherbe, arrived in California late last week and has enjoyed excellent waves and conditions at the Oceanside Pier, venue for this year’s event. With over 320 competitors from 36 countries participating, this is the biggest edition of the annual contest since the ISA Junior Championship was inaugurated as a stand-alone event in Durban in 2002. After finishing eighth, sixth and seventh in the last three years, the SA team event will be going all-out to emulate the glory days of 2011 when they finished second to hosts Peru in the team standings and returned home with four medals. The opening ceremonies were held on Sunday. 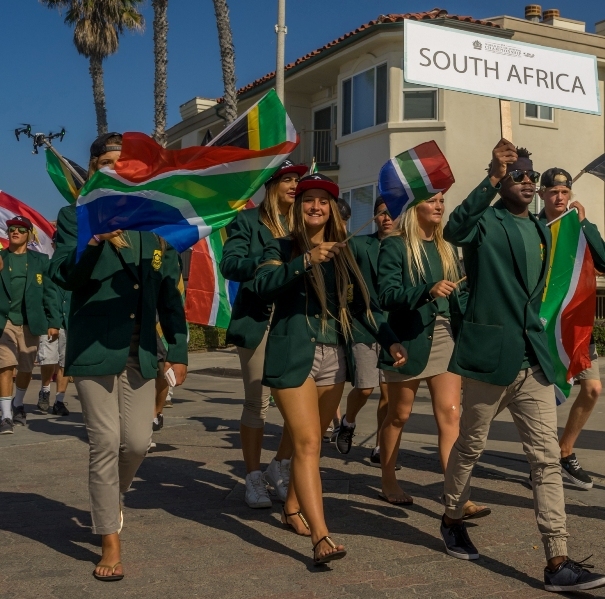 First all the teams marched down the boardwalk to the Junior Seau Oceanside Pier Amphitheatre in the colourful Parade of Nations. That was followed by the stirring Sands of the World ceremony where participants from each nation added sand from their home beaches to a special glass receptacle to symbolise the peaceful gathering of the nations of the world through surfing. The participants were welcomed at the amphitheatre by the Dancing Cloud Singers from the San Luis Rey Mission playing ceremonial drums before speeches from dignitaries and ISA President Fernando Aguerre officially declared the event open. The event consists of national teams made up of four Under 18 and four Under 16 boys along with two Under 18 and Under 16 girls. They compete for individual honours with the top four finishers in each division being awarded gold, silver, bronze and copper medals at the closing ceremony next Sunday (18 October). The top eight nations from the previous year’s standings also compete against each other in the exciting ISA Tag Team event. A selection of four boys and one girl compete in a relay style competition with each competitor having to ride two waves before returning to the team box to tag the next surfer within a specified time limit. The opening day of competition will see Rounds One of the Under 18 and U16 boys in action. Sykes (U18 boys) and Joshe Faulkner (U16 boys) will be the first South Africans to take to the surf when they compete in their respective divisions. The event is run simultaneously on dual podiums on the North and South sides of the Oceanside Pier. The contest uses a double-elimination format with the top two in each heat advancing to the next round of Main stream. The third and fourth placed surfers drop into the cutthroat Repercharge stream where they compete in almost double the number of heats, but can advance all the way the Grand Final in their division provided they do not finish outside the top two in any further heat. 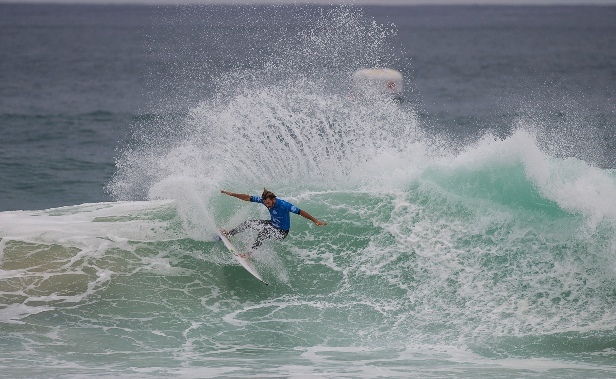 Jordy Maree Leads Cape Town to Victory by Taking U17 Boys’ Title in all Cape Town Final! 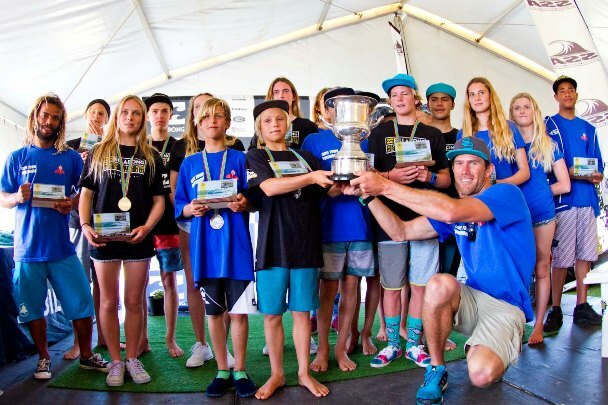 Cape Town Surfriders district clinched the coveted Freedom Cup for the team accumulating the highest points at the 2015 Billabong SA Junior Champs which was completed in good one metre waves at the Lower Point in Jeffreys Bay today (Sunday). The Cape Town team also clinched two of the six individual titles at stake and provided eight of the 24 finalists, earning 32 576 points to finish well ahead of hosts Nelson Mandela Bay (27 956) and third placed defending cup-holders eThekweni (25 170). Cape Winelands repeated their fourth place in the team standings of last year, followed by Buffalo City, Eden, Ugu, the SA Development Academy and uThungulu. Jody Maree (Cape Town) triumphed in the premier U17 boys’ final where all four finalists came from the South Peninsula area. Maree posted a winning heat total of 16.17 out of 20 with runner-up Ford van Jaarsveldt representing Cape Winelands earning 12.80 to finish just ahead of Cape Town’s Jake Elkington and Ethan Fletcher. Chrystal Hulett (Nelson Mandela Bay) finished well clear of second placed Pippa Jones (Cape Town) in the premier U17 girls’ division, earning 15.87 points to the 10.40 for the runner-up. Taghiti Gericke captured Eden’s only podium finish with third place while Kia Fenton from Nelson Mandela Bay was fourth. The U15 boys’ title went to a plucky Max Elkington (Cape Town) who recovered from a serious arm injury earlier in the year to secure a nail-biting 15.67 vs. 15.50 victory over local favourite Sebastian Williams (Nelson Mandela Bay). Luke Slijpen (Cape Town) and Angelo Faulkner (Nelson Mandela Bay) finished third and fourth respectively. Jeffreys Bay local Kirsty McGillivray, who earned one of the two perfect 10 point rides earlier in the event, carried that form into the U15 girls’ final where she racked up a heat tally of 12.84. Defending division champion Sophie Bell took second place ahead of eThekweni teammates Olivia Izzard and Christy Gilmore. Surfers from eThekweni dominated the U13 results with Brayden Bergset putting 15.50 points on the scoreboard to take the title from the Cape Town pair of York van Jaarsveld (13.83) and Manoa Robb while Dillon Hendricks (Nelson Mandela Bay) grabbed fourth spot. The 2015 U13 girls’ SA Champ is Gabi Lailvaux (eThekweni) whose heat tally of 16.0 gave her a dominant win over Cape Town’s Summer Sutton (10.94), teammate Kayla Nogueira and Lisa van Heerden (Cape Winelands), who finished in that order. The specialty awards for individuals and teams saw Cape Town win the Billabong / Bad Billy’s Tag Team Paddle Battle and R5 000 for the association. Hosts Nelson Mandela Bay earned the Skull Candy ‘Stay Loud Team Spirit Award’ and R2 500 for their association. Adin Masencamp (Cape Winelands) is the proud owner of custom BOS surfboards signed by big wave legend Grant ‘Twiggy’ Baker for posting the BOS Highest Heat Score, Joshe Faulkner (Nelson Mandela Bay) took home the DaKine product hamper worth R5 000 for the DaKine Most Progressive Manoeuvre, Dillon Hendricks (Nelson Mandela Bay) pocketed R2 000 plus a year’s subscription to Zigzag Magazine in the Zigzag Blowing Up Award and Bevan Willis delivered the best aerial manoeuvre in the VonZipper Airshow and earned R2 000 and a BOS hamper. The 2015 Billabong SA Junior Champs will be remembered by all who attended for the five days of flawless waves at the Lower Point in Jeffreys Bay and the stellar performances by the country’s top young surfers. The Billabong SA Junior Champs presented by BOS was proudly supported by DaKine, VonZipper, Skull Candy, Neff and Zigzag Surfing Magazine. Note: High resolution images are available for media outlets on request. Max Elkington Posts First Perfect 10 Point Ride of the Event! Clear skies, light winds and pumping 1.0 to 1.5 metre waves pouring through the Lower Point lineup at Jeffreys Bay delivered the ideal platform for the country’s top junior surfers to produce blistering performances on Day 3 of the Billabong SA Junior Champs presented by BOS. Max Elkington, representing Cape Town in the U15 boys division, posted the first perfect 10 point ride of the event when he carved up an overhead wave and finished with an explosive backhand re-entry. Elkington, last year’s U13 champion, went on to win the heat and advance to the quarter-finals along with runner-up Saxton Randall (eThekweni). Not to be outdone, Nelson Mandela Bay’s top seed Sebastian Williams racked up a two wave heat total of 18.17, marginally less than the highest heat tally of the division (18.50) that he set on Wednesday, and will be up against Elkington in a highly anticipated matchup in the quarters. Adin Masencamp from Cape Winelands was on fire again, earning scores of 8.67 and a near-perfect 9.77 for a total of 18.44, the highest of the U17 boy’s category. The 2014 U15 champ continues to look a likely contender for the U17 title this year, but faces tough opposition from Bevan Willis (eThekweni), who he faces in the quarters; Tristan Lev and Joshe Faulkner (both Nelson Mandela Bay) and the Cape Town pair of Ethan Fletcher and Jordy Maree, all of whom were heat winners today. York van Jaarsveldt (Cape Winelands) was the top scorer in the U13 boys, where Aye Gericke (Eden). Manoa Robb (Cape Town) and Tide-Lee Ireland (EThekweni) were impressive, while Summer Sutton (Cape Town) was the standout in Round 2 of the U13 girls. The U15 girls took to the surf late in the day and Sophie Bell (EThekweni) stayed on track to defend her 2014 title with another brilliant performance. Others to shine in Round 3 included Cape Town’s Anna Jellema Butler, Bell’s teammate Olivia Izzard and Jeffreys Bay local and Nelson Mandela Bay team member Kirsty McGillivray. The final action of the day saw the first of the lucrative specialty events decided when Cape Town won the Billabong / Bad Billy’s Tag Team Paddle Battle and earned R5 000 for the district’s coffers when they triumphed in the five person tag paddle race. The Billabong SA Junior Champs presented by BOS runs until Sunday when the winners in the U17, U15 and U13 boy’s and girl’s divisions will be crowned the 2015 SA Junior Champions. The district team accumulating the highest point tally across all divisions will be awarded the highly prized Freedom Cup and the winners of the U17 and U15 divisions will be awarded national team blazers. 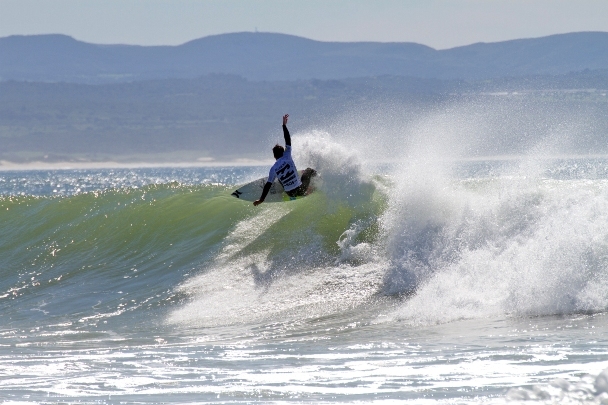 The event also offers specialty awards totalling more than R20 000 for both surfers and their teams. These include the Billabong / Bad Billy’s Tag Team Paddle Battle, BOS Highest Heat Score, VonZipper Airshow, DaKine Most Progressive Manoeuvre, Skull Candy Stay Loud Team Spirit and the Zigzag Blowing Up awards.